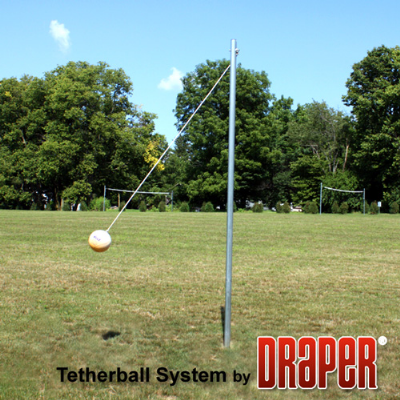 Tetherball System consists of a post constructed of 2-3/8" (60mm) 13 gauge galvanized tubing, a 5-ply yellow rubber covered ball with nylon wound butyl bladder and reinforced, recessed rope attachment and braided nylon rope. Overall length of post is 11’6" (351cm) to allow for 18" (46cm) to be set in concrete flooring or optional ground sleeve. Bottom of post notched to prevent rotation in footing and/or ground sleeve.